When investigators watched the surveillance video, they noticed the masked robber appeared to give the store clerk something in return for the stolen cash. CLINTON, Tenn. — A store clerk who at first appeared to be the victim of an armed robbery turned out to be an accomplice, according to the Clinton Police Dept. The robbery happened on Feb. 5 at the Lee's Travel Center located at 2233 N. Charles G. Seivers Blvd in Clinton. Justin Pennington was working behind the counter when he said a masked man threatened to stab him unless he opened the cash register and handed over the money. Investigators watched the surveillance video and saw something more. After the masked man, later identified as Jacob T. Maiden, took the money from the cash register, he placed two bags on the counter. The video showed Pennington putting those bags in his pocket. Turns out, according to Clinton P.D., those bags likely contained narcotics. Maiden was arrested on February 6 and charged with criminal conspiracy, theft of property and manufacture/delivery/sale/possession of methamphetamine. Pennington was also taken into custody on February 6 and charged with criminal conspiracy, theft of property and possession of schedule II. 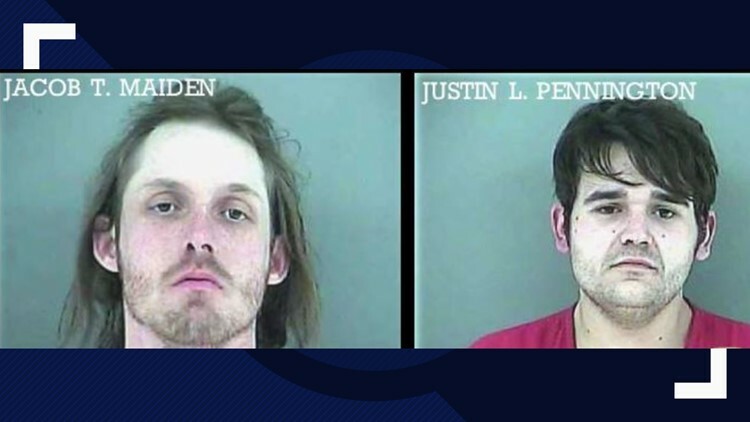 Both men are being held in the Anderson County Jail.